Another tutorial thingy. This one is on Daffy. I'll do more on how to draw duck bills later. Done for this group on DA. It's also here. There isn't anything of TLTS in this one. I think he's mostly McKimson here with slightly big cute eyes. I'll probably do some of these on the redesigns later. Right now I'm working on some requested classic characters. The new Daffy has that head slope thing they do with Looney Tunes now, a super wide bill, pointy toes, and super pointy tailfeathers. I really like the new show. It's not perfect but it's really funny. I love psycho Lola for one. 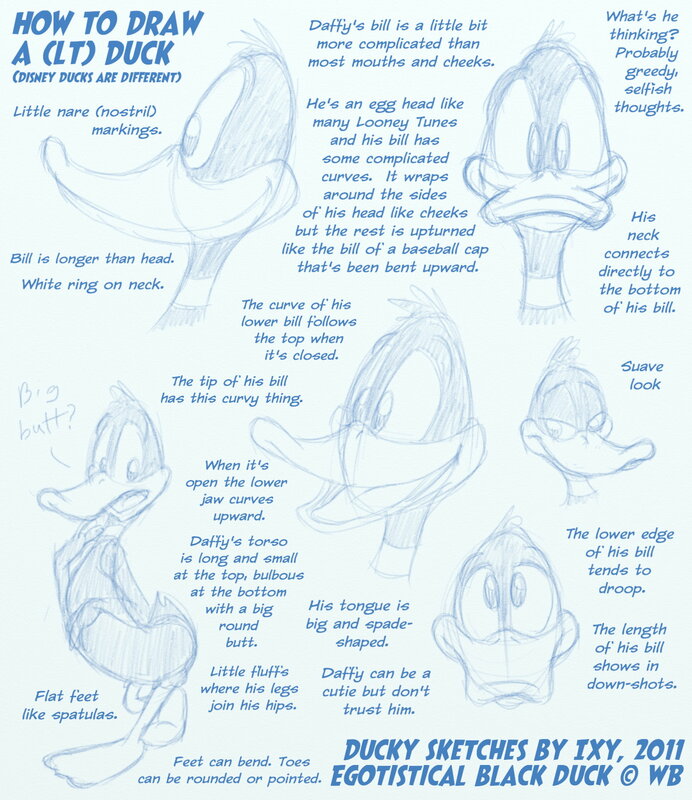 One can really tell how fundamental his bill is, to Daffy's design. He'd be speechless without it. I so love Daffy!! He's always so very cute!! Thanks for the instructions!!! I'll have to do more ducky tutorials too. Disney ducks really are different. Only DW is more like a WB duck than a Dizzy duck.